Haleiwa, Oahu • With quality food in generous portions and a convenient location in historic Haleiwa Town, the original Haleiwa Joe’s, which boasts gorgeous views of the harbor, ocean and sunsets, is a versatile, much-loved semi-casual dining spot. A favorite of celebrities and the local surf crowd, it’s known for its monstrous prime rib (served in limited quantities, so get there early for it) and friendly, prompt service. Long after the sun goes down, this is the place to relax, listen to live music, and celebrate with friends on the weekend nights. Honolulu, Oahu • Alan Wong’s is a name that comes up on every list of Hawaii’s best restaurants, and rightfully so. The James Beard-winning establishment, favorite of the Obama family and flagship culinary experiment of celebrity chef and Hawaii Regional Cuisine pioneer Alan Wong may not have an ocean view, but what’s important to its fans isn’t the location; it’s the exquisite, locally-sourced food. 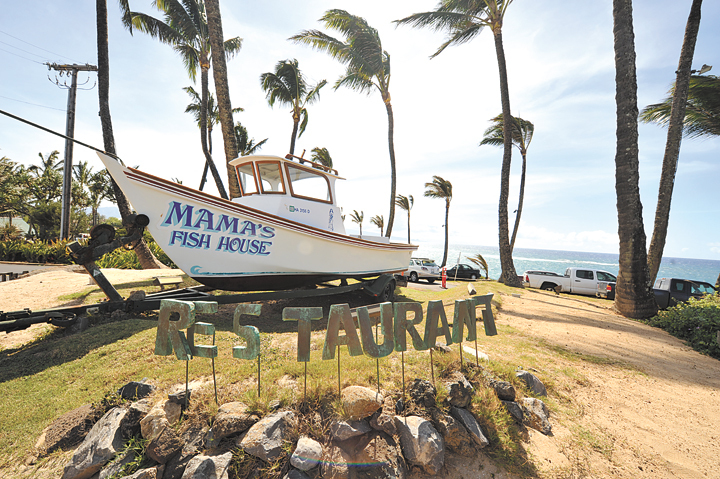 Fresh fish and seafood preparations are the stars of this show, from the Misokaki North Shore Tilapia to the shrimp and clam linguini, although the signature twice-cooked shortrib also gets top marks. Lahaina, Maui • A community-conscious (they do a number of events annually for charity), beachfront dining establishment with a picture-perfect view of Lanai and Molokai known for its fresh local fish, succulent steaks and signature Hula Pie, Kimo’s has been a Maui favorite for just over 40 years. Guests love the koa-lined walls and vintage New England vibe of the upstairs lounge and the toes-in-the-sand downstairs area, where relaxing under an umbrella is the thing to do. Make reservations for sunset and stay after dinner for Hawaiian music and an excellent tropical Mai Tai. Waimea, Hawaii Island • Celebrated chef Peter Merriman’s flagship restaurant, this community mainstay, with its fresh locally sourced ingredients and exquisite presentation has been serving up exciting Hawaii Regional Cuisine for 20 years. Crowd favorites include the perfectly cooked, freshly-caught fish and expertly customized beef filets. Don’t forget to order a sumptuous dessert, like the classic chocolate purse, and one of their legendary Mai Tais. Whether you visit for breakfast, brunch, lunch, happy hour or dinner, the consensus here is that Merriman’s is an experience you won’t soon forget.